In late January, the ringed planet Saturn will be sitting very low in the southeastern sky before dawn. On Tuesday, Jan. 24, the old crescent Moon will sit only 3 degrees northeast (to the upper left) of the planet. The best viewing times are between 5:45 and 6:45 am local time. Mercury will be located some 16 degrees to the lower left of them. 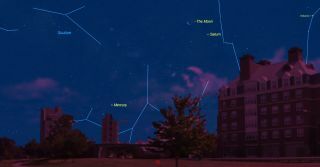 Check out the southeast sky about an hour before sunrise on Tuesday morning (Jan. 24). There you will find a lovely crescent moon and hovering to its lower right will be a bright "star" shining sedately with a yellowish-white hue. But that's not a star, it's a planet: the famed "ringed wonder" Saturn. Probably the most popular planet, especially for beginners in astronomy, to seek out with telescopes, Saturn currently is rising around 4:30 a.m. local time ... or about an hour before the break of dawn. The rings are not evident with unaided eyes; you will need a telescope magnifying at least 30-power to bring them into view. Even with such a minimum amount of magnification, the view is striking and in larger instruments even more so. With a 6-inch telescope at 150-power, Saturn is a beautiful sight; with a 10-inch telescope at 250-power the view is breathtaking. Interestingly, the four extremes of the changing orientation of Saturn's rings closely line up with the positions in the sky for the solstices and equinoxes as seen from here on Earth. When it is near those points in the sky where the sun marks the summer or winter solstices, Saturn's famous ring system is tilted near its maximum inclination (27-degrees) toward Earth, presenting a spectacular view even in a small telescope. Conversely, when Saturn lies near the points of either the March or September equinox, the rings are edgewise or very nearly so; they then appear as nothing more than a bright line that bisect the planet ... or, because they are so thin, the rings might even seem to disappear. Currently, Saturn is located in the non-zodiacal constellation of Ophiuchus, not too far to the west of Sagittarius and that point in the sky where the position of the sun marks the winter solstice. Indeed, the northern half of the rings are now tilted 26.7-degrees toward Earth, almost as “open” as they can get (the maximum of 27-degrees will come in October). But while this certainly makes Saturn a “must-see” object for those with telescopes, there are also two drawbacks for prospective observers. The first is that for those in mid-northern latitudes around 40-degrees north, Saturn will remain at a relatively low altitude even when it reaches its highest point in the southern sky. Sky objects lower than 30-degrees above the horizon tend to be adversely influenced by atmospheric instability. And for the next few years, Saturn, unfortunately, will never get higher than 30-degrees above the horizon. The other drawback is Saturn will be farther than usual from Earth this year and next. Even at its upcoming June oppositions in 2017 and 2018 it will get no closer to us than about 840 million miles (1.352 billion km). Compare that to December 2032, when Saturn will be in the constellation Taurus and close to the point in the sky marking where the sun is at the summer solstice. The south face of the rings will then be tilted nearly to their maximum extent toward us while Saturn climbs high into the sky. It will also be about 100 million miles closer to Earth than it is now and will appear to gleam nearly twice as bright. Beggars, can't be choosers, however and although viewing circumstances are not as good as they will be 15 years from now, we still should enjoy the wide-open appearance of the rings in 2017 as well as the eye-catching pairing of the moon with Saturn early Tuesday . Joe Rao serves as an instructor and guest lecturer at New York's Hayden Planetarium. He writes about astronomy for Natural History magazine, the Farmers’ Almanac and other publications, and he is also an on-camera meteorologist for Fios1 News in Rye Brook, NY. Follow us @Spacedotcom, Facebook and Google+. Originally published on Space.com.